Convert your Axial SCX10 II chassis mounted servo (CMS) to axle mounted servo. 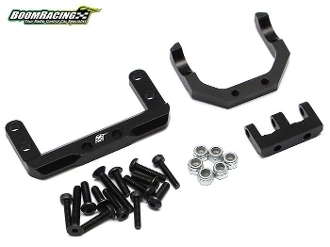 They will fit directly on the Boom Racing AR44 PHAT Axle Housing without any modification. Will also fit the stock plastic Axial SCX10 II AR44 axle housing with some DIY modifications. The set comes with an aluminum 4-link truss for you to swap the axle up-side-down if you run a reversible transfer case (to eliminate torque twist). 2. Align the truss on the axle housing and use a 2.0mm drill bit to open four holes all the way through. 3. Use the four M2.5 X 12mm socket head screws provided to secure the truss onto the housing. Note: For more precise drilling, after drilling the first hole, tighten the bolt to secure the mount. Then drill the second hole, and so forth. 1. File down or cut away the 4-link axle mount on the axle.